I was listening to WABC-AM when he introduced the Seekers record I Will Never Find Another You by saying it was about a Scrabble player trying to spell the word "uvula." I was just dozing at home when I heard his intro and had a major Ingram chuckle. That "other day" was in 1968, almost exactly fifty years ago. That specific chuckle, along with laughs, guffaws, chortles, gasps, and the occasional bout of wide-eyed astonishment wasn't my first nor my last. Dan Ingram's radio show was a mighty magic amalgamation of myriad marvels merged in majestic magnificence, with mirth, merriment, and melody*. He died a few days ago at his home in Fort Lauderdale, Florida, at the age of 83. How did that come to be? Remarkably and miraculously, due to a minor incompetence. I had applied for the vacation relief job and was called in for an interview with the legendary Sammy Aed. He was interviewing me along with another guy, and he put us to the question: How good are you at splicing tape? The other guy eagerly avowed his superb credentials; I, having no inkling of the import of this question, averred that I had used a splicing block on occasion. Off to Network Radio for the other guy, and WABC Local Radio for me. Next thing I knew, I had not just a dream job, but the foundation for the remainder of my corporeal existence to this very day. Thanks, Sammy! Thanks, Other Guy. During my more-or-less five year tenure with WABC, Dan Ingram was the afternoon guy. Depending on my school schedule—Win Loyd, my boss and chief engineer was very accommodating—and the needs of the station, I would typically be the "board engineer" for between two and four hours per day, the rest of the time working with the news department, doing routine maintenance, taking union-mandated breaks, and occasionally napping under a console or doing a Nathan's run if I was on the night shift. A radio station is a 24-hour per day operation; I was young and chronologically flexible, so I was often asked to change my work schedule with little notice. Hence, I could work with Dan or any of the others for days or weeks at a time, or even find myself out in New Jersey doing maintenance on the transmitter. It would be fair to say that I enjoyed working with Dan the most. By far. Big Dan Ingram and I were very similar in one respect. We're both big. About the same height and weight at the time. But Dan had the microphone, and all I did was push the buttons at his cue. 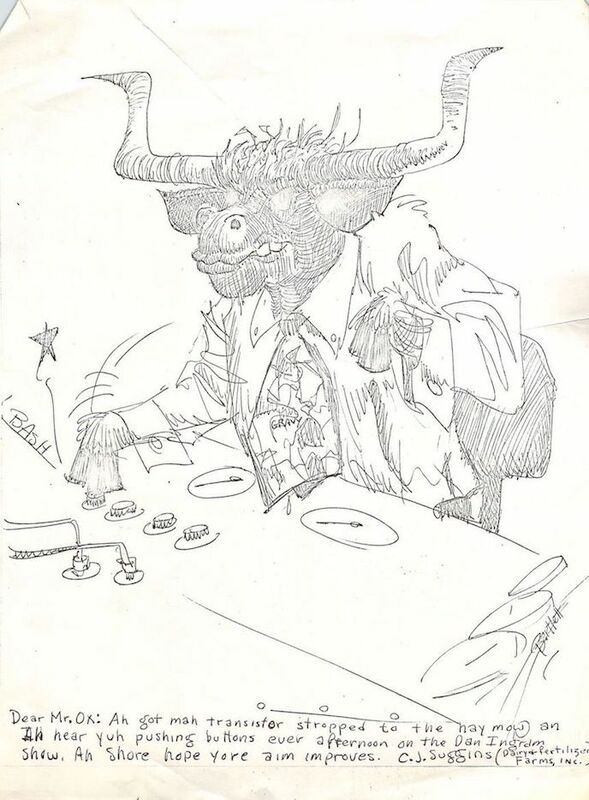 He developed what I hope was an affectionate nickname for me: The Evil Ox. My nickname for him, if I had the same air access, might have been Mr. Ingram. I'm OK with humor at my expense (and expanse), and never filed a grievance as some of the older and more persnickety union guys might have done. (Perhaps that explains why we younger guys got most of the air shifts.) I accepted and reveled in being Dan Ingram's Evil Ox. My nickname stuck until I left the station for a safer job, workin' in a defense plant. Dan used it on the air often enough that listeners grew familiar with it. I started receiving fan mail! The cartoon above came in the mail to the station. I think it was actually addressed to Mr. Evil Ox. It's signed by Mr. C.J. Suggins, whose style appears identical to that of one L. Bartlett, below. Never heard from "either" one and neither name nor pseudonym has appeared on the occasional internet search. A talented dude (or dudette) nonetheless! Dan could be occasionally cranky or moody, but when he was "on," being in the studio with him was the equivalent of ten Ingram Flingrams during one afternoon show. Quite the privilege almost all of the time. Dan came from a musical family, and was very well attuned to pitch as well as timing. He was noted for detecting a tiny pitch change in a record as the generators wound down during the great Northeast Blackout of 1965. Far more entertaining was a prank I played on him on April Fools day, (probably) 1975. We had just started making a product that could change the pitch of live material, and I took a little trip up to visit my buddies at WABC. May I connect this, please? Starting with a tiny pitch change on his voice fed into his earphones, I continued to drunken-sailor territory. Needless to say Dan handled it with aplomb and humor, and neither I nor my new product suffered the physical abuse to which we were arguably entitled. Of course Dan was a bit of a prankster himself, usually at the expense of the poor guy reading the news on the hour. The "brief showers" story is legendary. The Heen and the Hern were real, but they were just gadgets. Dan's genius turned them into characters. I went through an electronic music phase in the '60s. After meeting Bob Moog in Trumansburg, New York, and being inspired by his approach to synthesis, I built a number of rudimentary instruments. One, a single-note synthesizer, used a keyboard from the conveniently located Schober Organ company. Another took advantage of the new integrated circuits to generate multiple octaves. WABC had a simple station identification "jingle" and I realized that by just programming a sequence of notes, I could recreate that jingle. Boring. But add a variable clock, tremolo, and extreme vibrato, it could make an infinite variety of station jingles. WABC paid for jingles, one at a time. Hmmm. I brought it in to work and showed it to Dan Ingram. The Hern was born. Dan was suddenly talking to it, coaxing a strange conversation from it, and feeding it phreams, which I think he made up seconds after dubbing it the Hern. It did double duty as the "mad organist." Do I remember how I happened to take a picture of Dan with a rubber chicken? No I don't, and I didn't supply the chicken, either. I don't even remember if I supplied the pen. I hope it's clear that I revered Dan	Ingram's talent, and enjoyed the time I got to spend with him at my "job" at WABC. I can't pretend that we were great personal friends, and we weren't in contact at all after my place of striving moved to New Jersey and I with it. But in 2011 I heard that Dan, now retired in Florida, was ill, and got in touch with his son Chris to issue my regards. To my pleasure and surprise, I got a message back, complete with a phone number and an invitation to say "Hello." We had a nice conversation, some reminiscence, and best wishes all around. 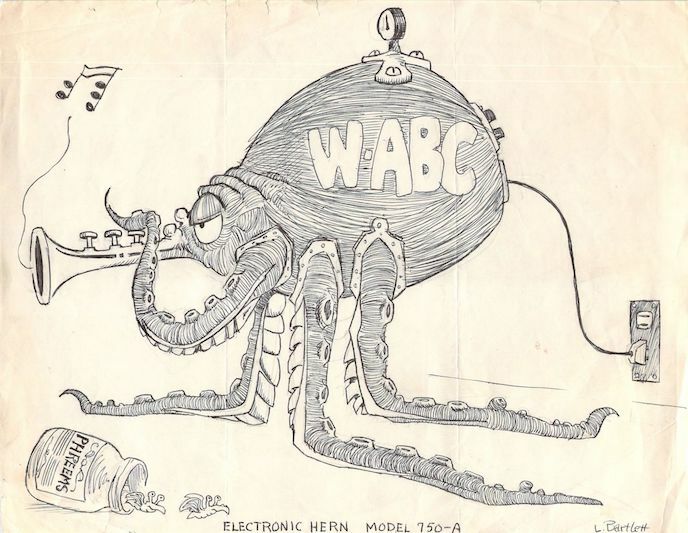 WABC was a big part of my early life, not just Dan and the other DJs, but the (almost all guy) engineering staff and other station workers. There are only a handful of the '60s crowd remaining, sad to say, and all I can offer you/them/us are these words and, if any of you know me personally, my best regards. I tend not to revise my blogitems, or, if I do, make clear that it's an update. But I spent hundreds of hours working with Dan and anecdotes keep popping into my alleged mind, usually accompanied by one of the humor-responses listed above. Why wouldn't I want to share them? Maybe this blog will find itself extended. Alas, there are unlikely to be any future-occurring anecdotes. 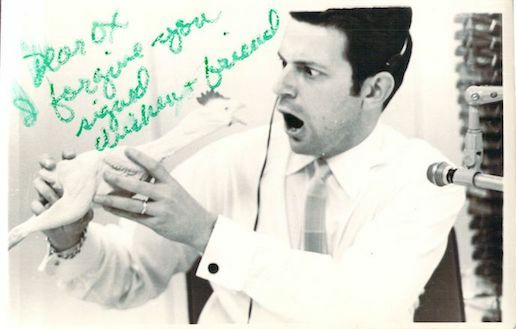 Many NYC radio people miss Dan Ingram, perhaps even as much as I do. If you want to share your thoughts or read the others, the excellent and extensive musicradio77.com site run by Allen Sniffen would be a good place to do so. If you're a glutton for spoken instead of written babble, the Gear Club podcast episode 6 and episode 7 have a few words from me about WABC and other personal history. * I didn't make that up myself; it was a tag that was normally associated with Cousin Brucie. I'm sure he won't object if I re-attribute it here. ** All of whom with the pleasant exception of Bruce Morrow have died in recent years. I still listen to The Cuz on Sirius Radio in the car. I think he enters a stasis field when he isn't on the air, and by now may be in his late 40s. 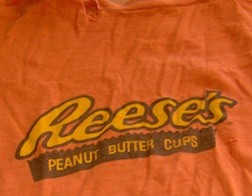 If ever there were a T-shirt that needs no introduction or explanation, this is it.